courtesy of franky242 / FreeDigitalPhotos.net. 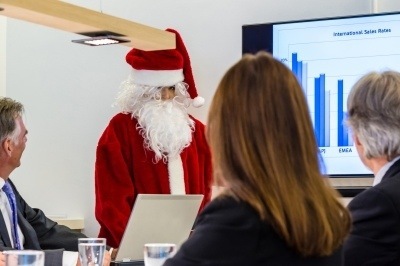 Celebrating the holiday season in a professional environment can get complicated. Not everyone does it the same way and nor do they all have the same financial circumstances. Sometimes in these situations the natural instinct is to procrastinate, further limiting the options, so what is ultimately available is either unappealing or cost prohibitive. Here’s some good news–with a bit of creativity, it’s still possible to get your festive hat on with colleagues in the spirit of inclusiveness. Also, the term “Holiday” can be interchangeable with “Winter” or “New Year” if you’d like to make it a bit more generic. If you’re going to exchange gifts (something most offices DON’T do anymore) doing a Secret Santa with a $5-$10 limit is the traditional way to make sure that everyone has something to open and no one is financially put-out. Having a Holiday Potluck is also fun, traditionally this is done with desserts but I find there are fun traditions tied to holiday breakfasts so switching it up and asking coworkers to bring potluck morning treats is a nice twist on the tradition. A recipe swap can also be fun. Ask guests to bring a dish along with the recipe. You can either provide index cards and markers for guests to copy the recipe on or ask guests to bring index card with their recipe neatly printed in a sharpie or other bold instrument. Instead of other guests copying the recipe onto index cards, have them take a picture of the original card from the chef with their smartphone. As the organizer, you can do this too with all the treats and assemble a digital recipe book using ISSUU or Glossi as a remembrance of the occasion–just don’t forget to snap some photos of the dishes before they get mauled! A book share is a nice way to share memories during the holidays. It can be around a theme–your company mission or vision, creativity, inspiration, recharging, leadership–or just books that you loved growing up. You can ask that people buy a new book or recycle one from their home libraries. At the gathering, everyone brings their book and each book entities the bearer to claim one book in the share. Refreshments like cheese, fruit and perhaps wine or cider (flat or still) pair really nicely.